After my students did so well with my “Cask of Amontillado” lesson plans, I thought I’d reward them with a short “Cask of Amontillado” movie. Unfortunately, the movie was terrible. I now sit in fear, hoping they won’t follow Montresor’s example and exact revenge. I did find a few more. They’re so-so. 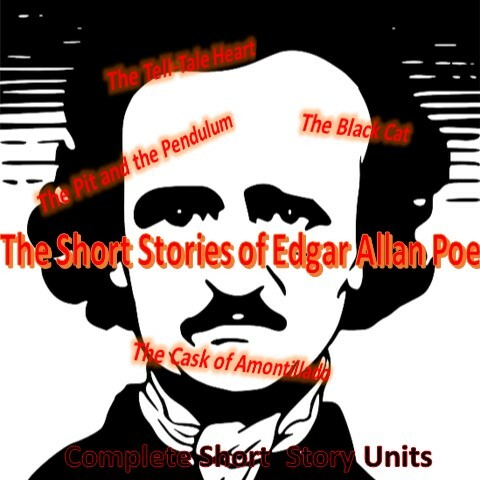 If you’re looking to do a Poe Unit but don’t want the suspense of wondering if your lesson plans are Poe-worthy, then check out the Poe bundle, which contains complete teaching units for “The Tell-Tale Heart,” “The Pit and the Pendulum,” “The Black Cat,” and “The Cask of Amontillado.” We also threw in a non-Poe unit plan that captures the essence of Poe, “The Monkey’s Paw” by W.W. Jacobs. Don't get walled in by common core standards. Write one of these on the board. Perhaps you’re wondering how you could turn this video into a lesson plan involving ELA Common Core standards? Do it with a chart: Literary Interpretation T-Chart. As you’re reading or after you’ve read, list 6-10 things in the left column that are important to the story. Here's the first one. It's kind of cheesy, but it stays close to the text. I will admit the end is quite chilling. You'll love the shouting match. This next one is a terrible movie. In fact, it's so bad they won't even let me show it anymore. It's even cheesier than the first, but if you're looking to kill 15 minutes...errrrr....looking to review the short story with your class, it'll work. Make sure you write one of the common core objectives on the board. You can even teach the lesson. That way your students will be practicing core skills while you enjoy this cheesy adaptation. Our third video won some award at the 2013 Sacramento film festival. I've never been to Sacramento. I didn't realize it was such a film hub. Anyway, this one doesn't follow the story as closely, but it is a fine adaptation. I am wondering about the setting: It's set in New Orleans in 1849--that's 12 years before the Civil War--yet Montresor is a wealthy African-American landowner. Besides that, this is far better than the previous 2 films. The acting is still cheesy, though.